Share something special with your friends, The Insulated Wine Tote will make it the center piece of your party, either if it is Boys night, Ladies night, at the Beach, Pool, BBQ, Picnic or even at Sea! "I love this product! 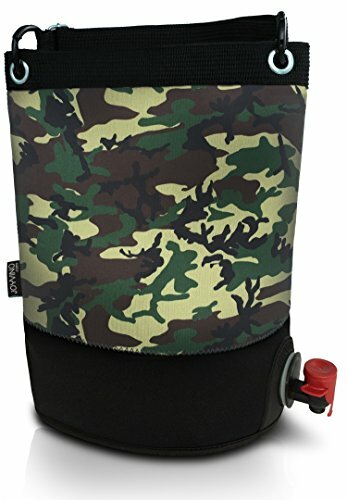 Bought for a family parties.. fill it up with whatever booze you like and it will stay ice cold for hours - Larry"
This bag holds an adjustable carry strap, a buckle as well as a name tag to keep it separated from mixing up with other wine bag fans and is perfect for any beverage. With the bag comes also a refillable bladder that keeps the wine or other drinks cold for up to 4-5 hours on a hot summer day! The durable clear plastic bladder holds up to 0.8 gallons / 100 oz / 3 liters of your favorite beverage. It is very easy detachable from the neoprene bag for refills, replacements and cleaning! Let's get the Party Started. Get your Wine bag by Clicking the "add to cart"-Button Now! If you have any questions about this product by Trendy Bartender, contact us by completing and submitting the form below. If you are looking for a specif part number, please include it with your message. Blind Wine Tasting Game Includes: Six Individually Numbered Bags, Storage Pouch & Pad Of Scoring Notes - All you need is wine! AfterEight Bring Me Wine Socks, Perfect Women's Birthday Gift Idea For 30th and 40th Present or Wine Accessory. Tube Socks' are Long, Thick, Warm and Comfortable. Made from Fuzzy, Soft Cotton Fleece.